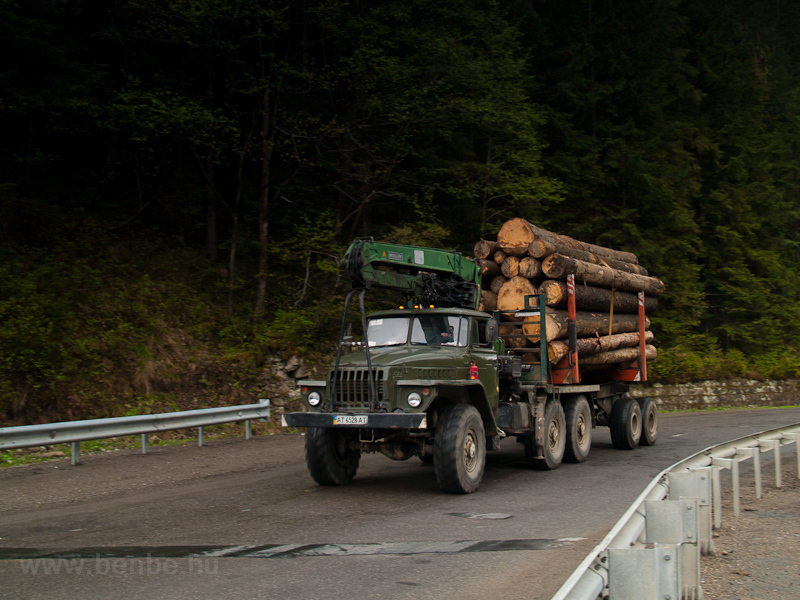 D1, 2M62U, ChME3 - the usual Ukrainian vehicles in the breathtaking landscape of the Easter Carpathian Mountains. 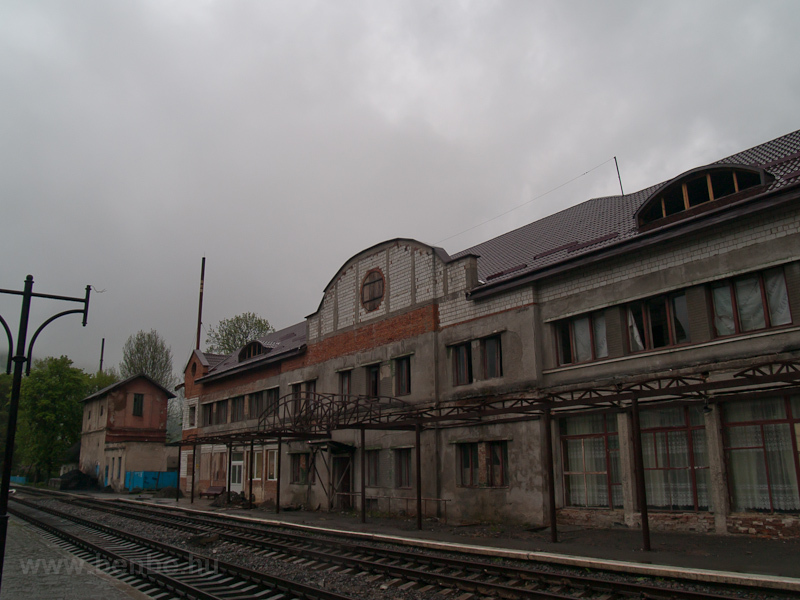 I'm publishing photos of a trip that happened more than eight years ago - somehow I never managed to upload them in the past. 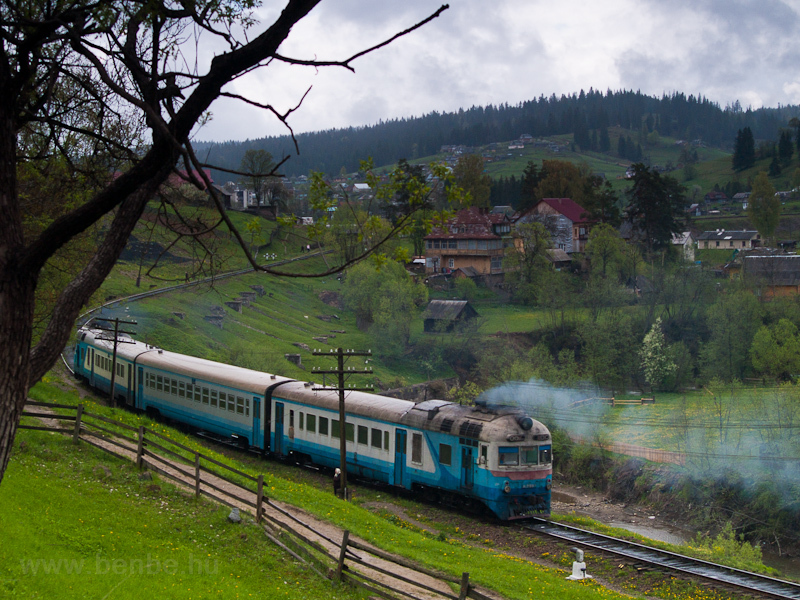 It was an interesting trip as we had a small bus with a dozen photographers running around in Ukraine with a busy programme and lots of fun together. 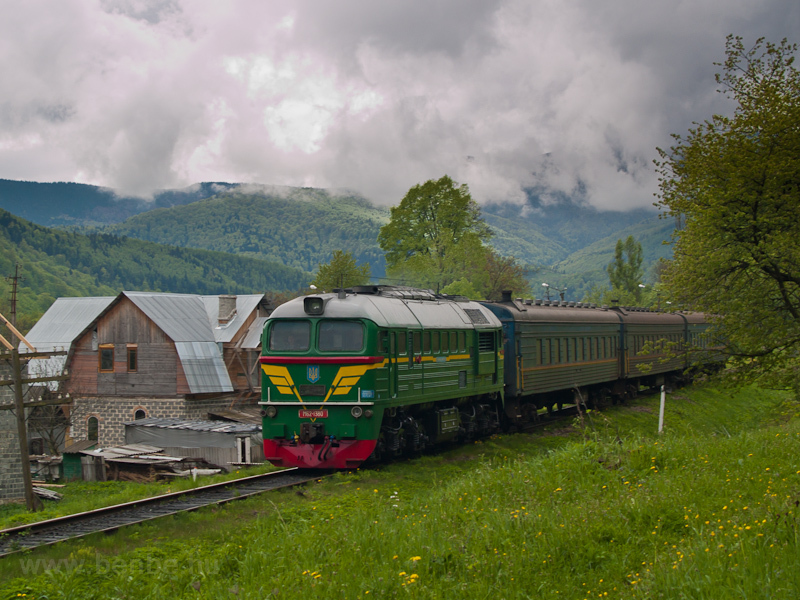 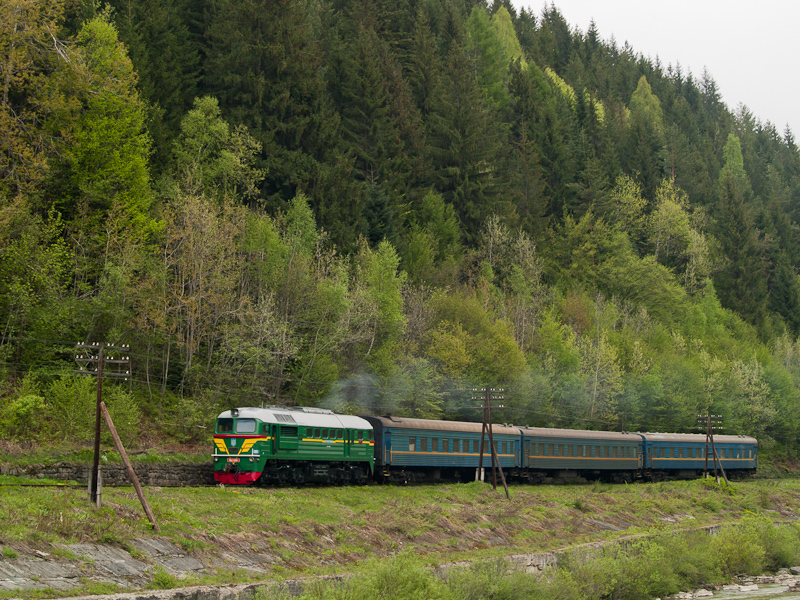 The last time I was here we didn't immediately come to the Tatar-pass, first we visited the Uzsok-pass, the Borzha-valley Narrow Gauge Railway and the lowlands of Transcarpathia . 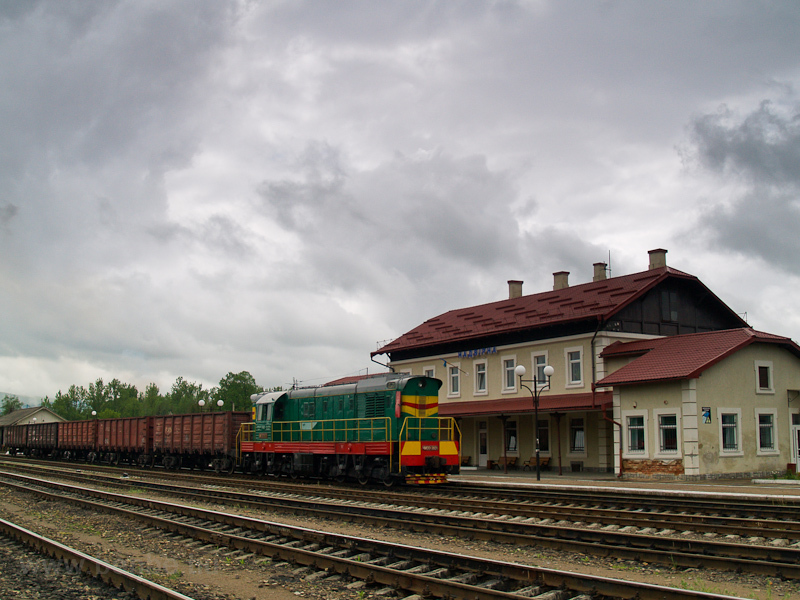 At this trip we only stopped for those two trains we came accross anyway then headed straight here so that we could take photos of the evening train departing from Rakhiv. 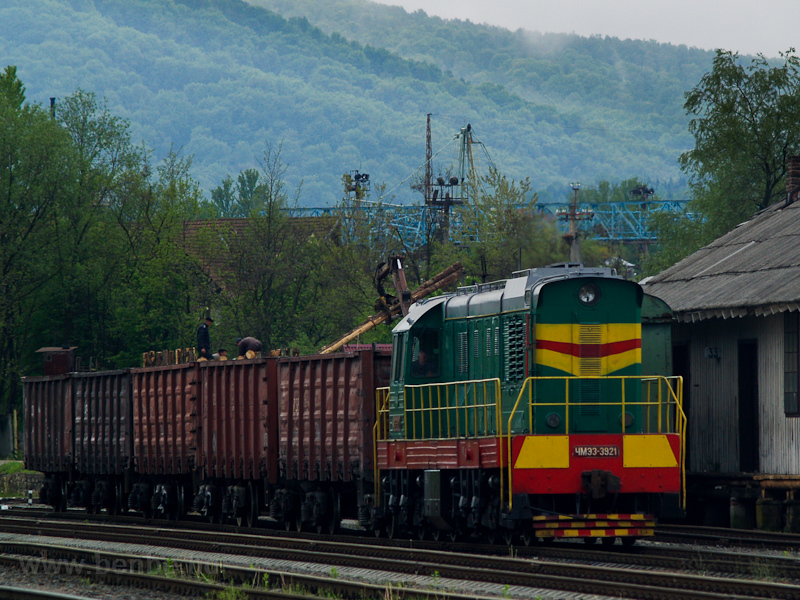 If you are not familiar with the railways between mainland and Transcaprpathian Ukraine, I can brief you quickly: there are three lines, the main line leads from Mukachevo over Beskyd to Striy and Lviv, almost entirely double tracked, but the main tunnel is only just being replaced funded by the EU by a sturdy, new, double tracked tunnel (the original one by MÁV is single tracked and now in a very bad condition). 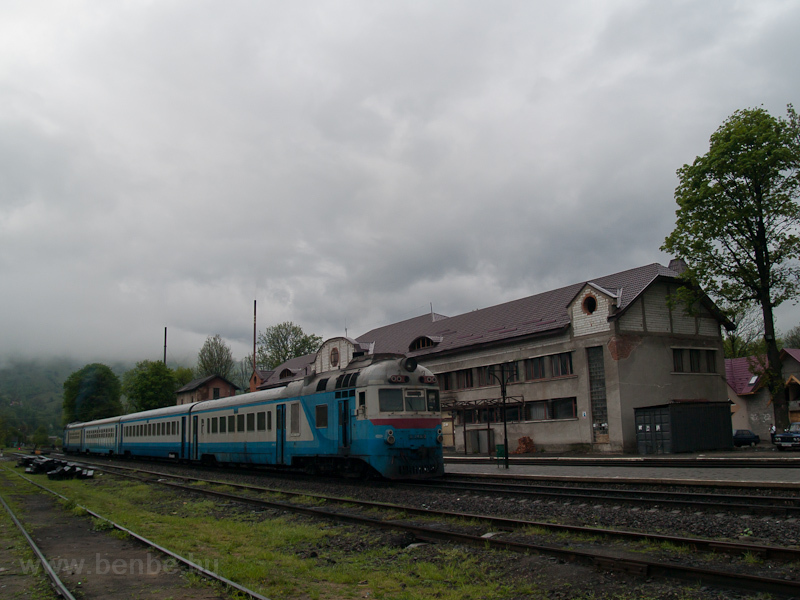 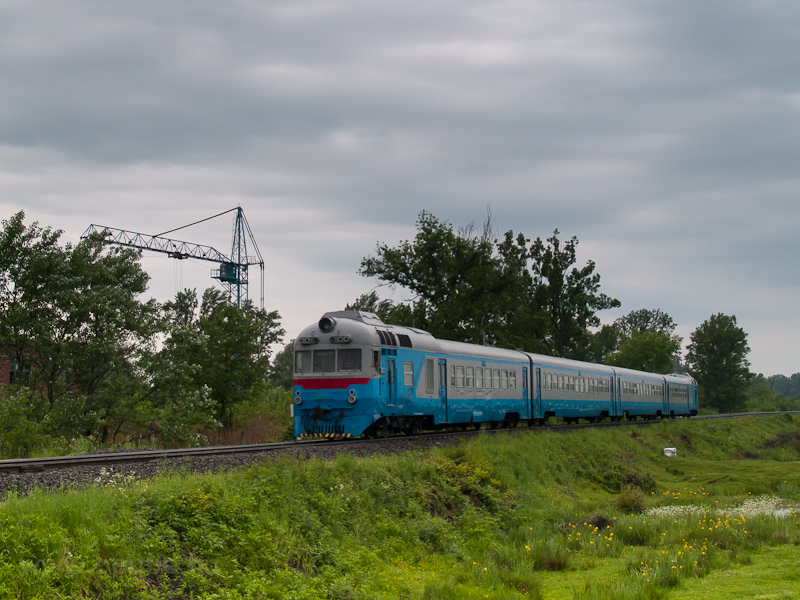 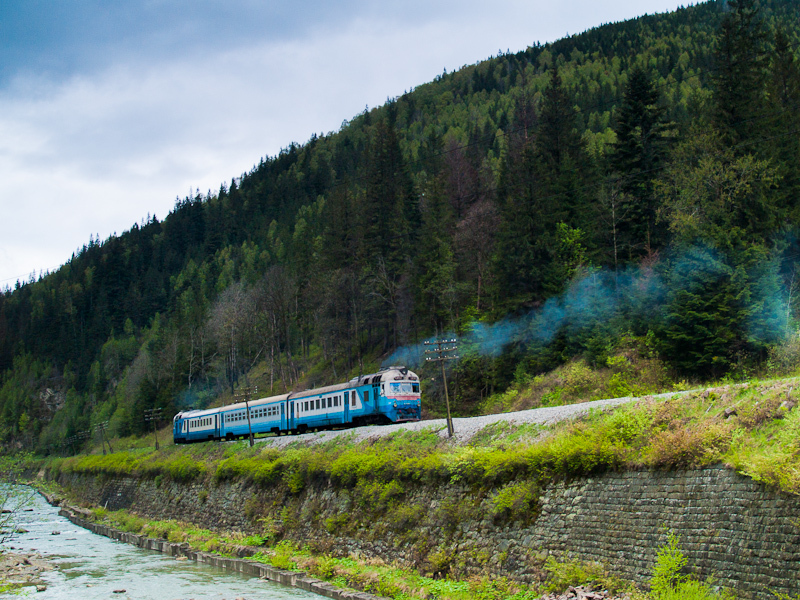 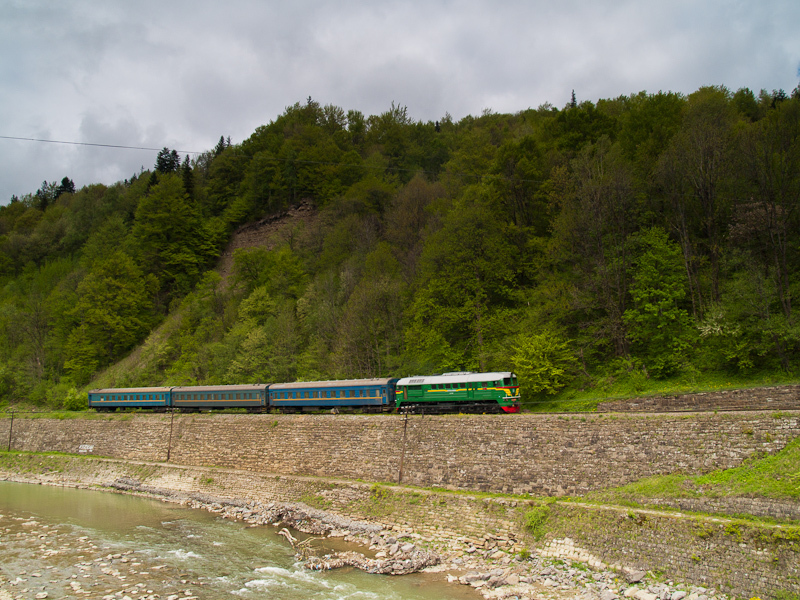 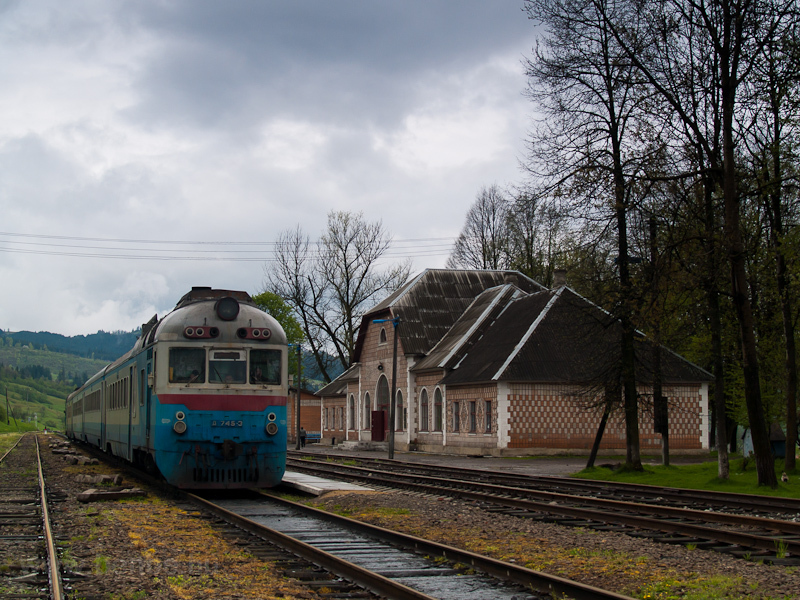 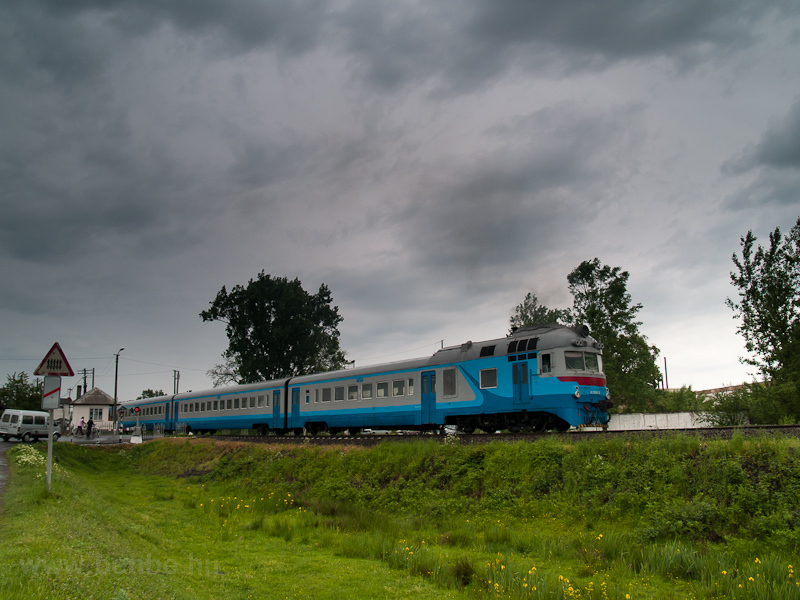 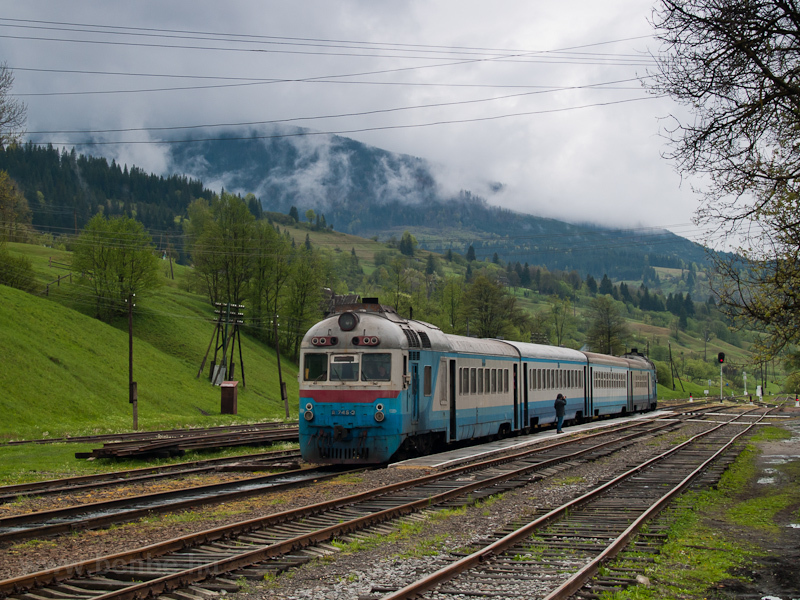 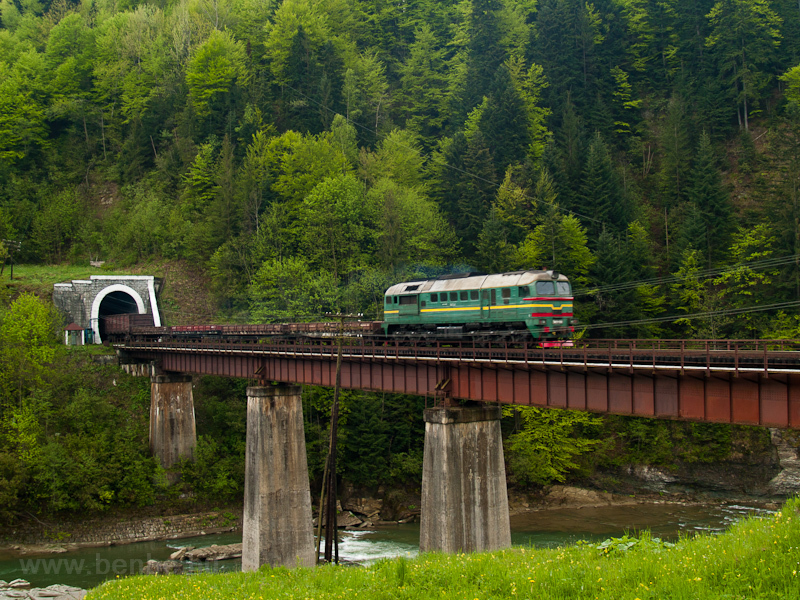 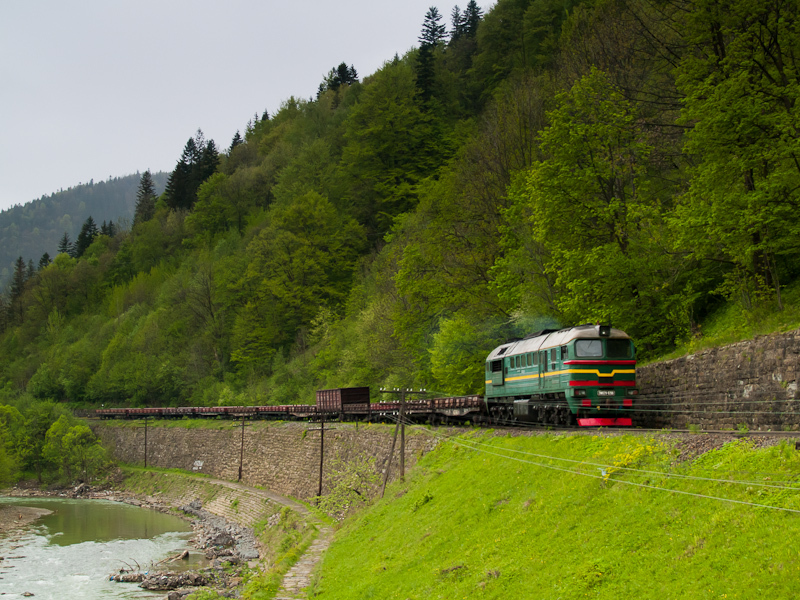 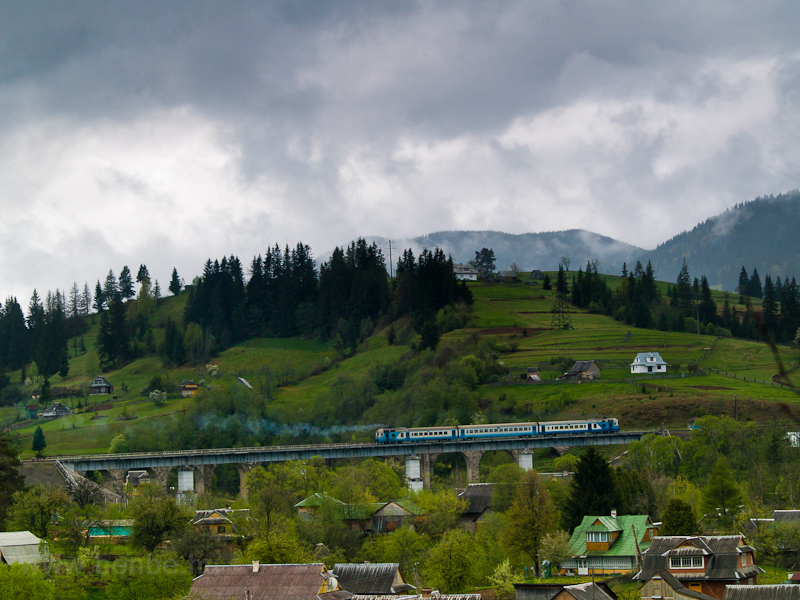 Another electrified route, single tracked entirely runes North from Uzhhorod to Lviv over the so-called Transcarpathian Semmering, actually climbing the pass. 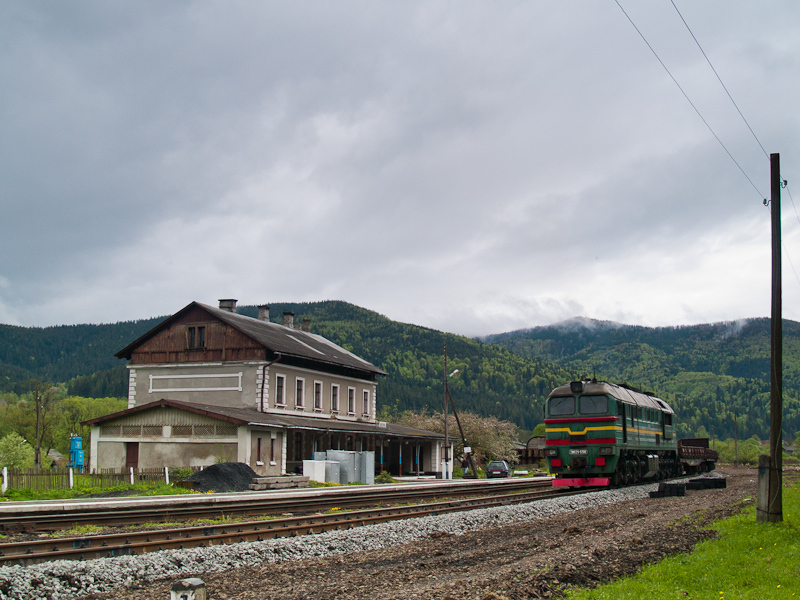 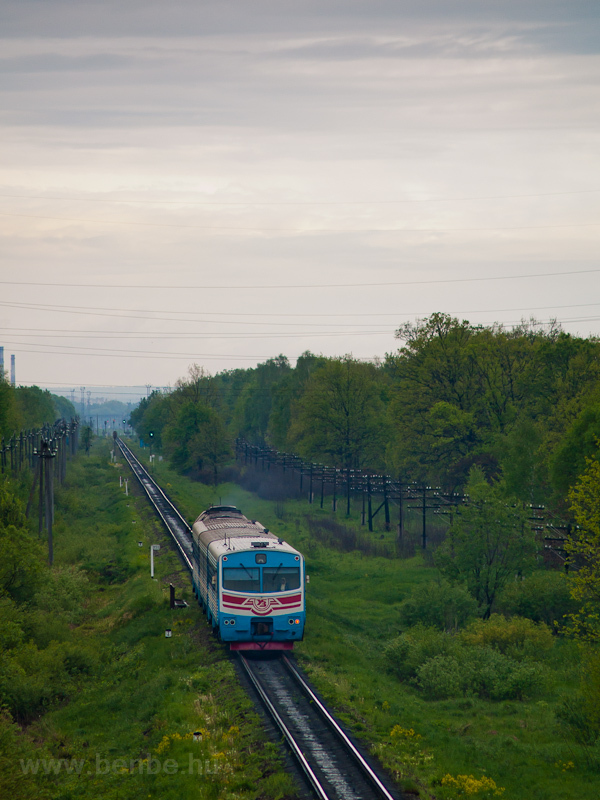 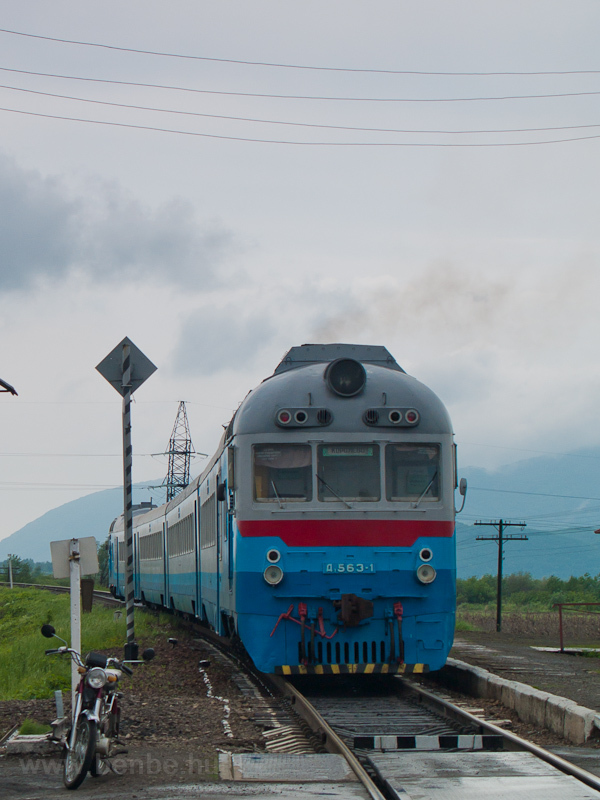 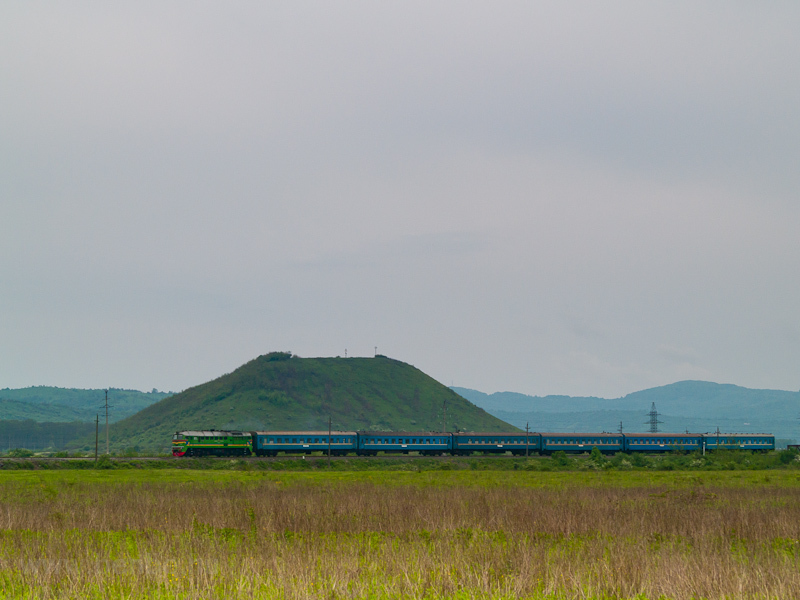 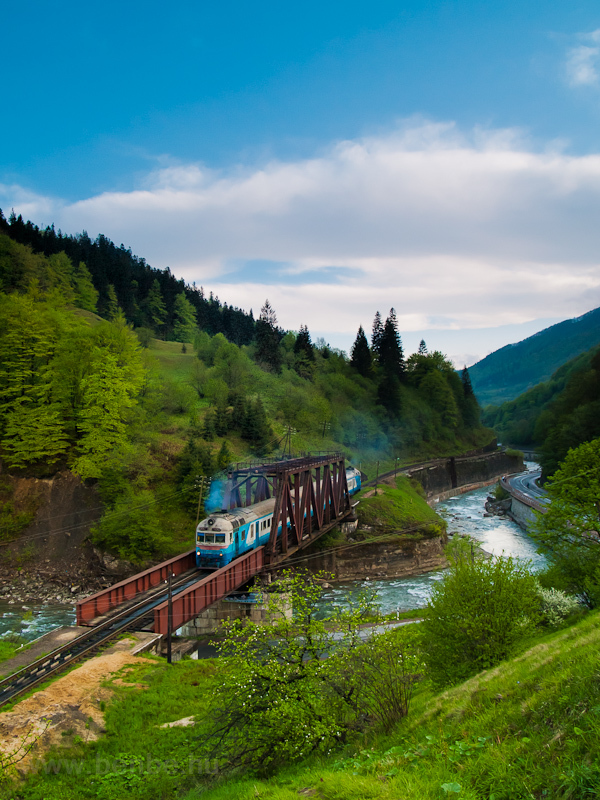 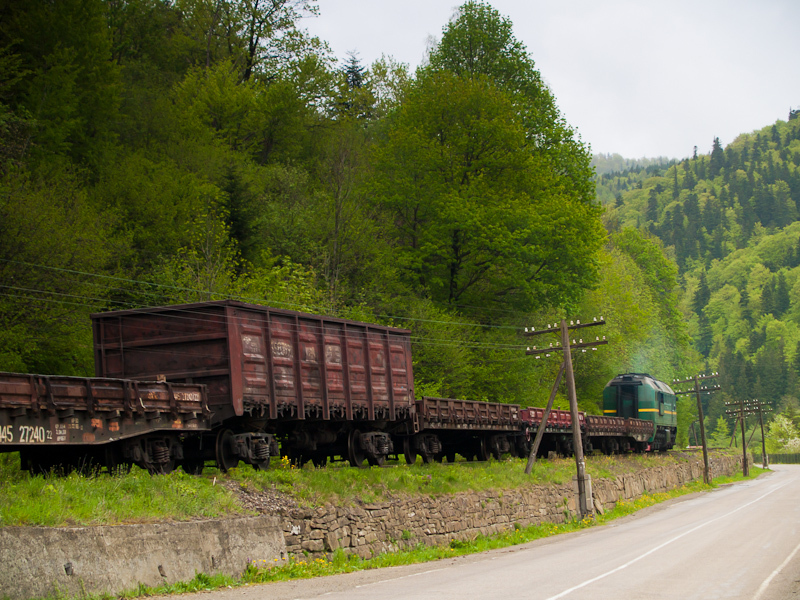 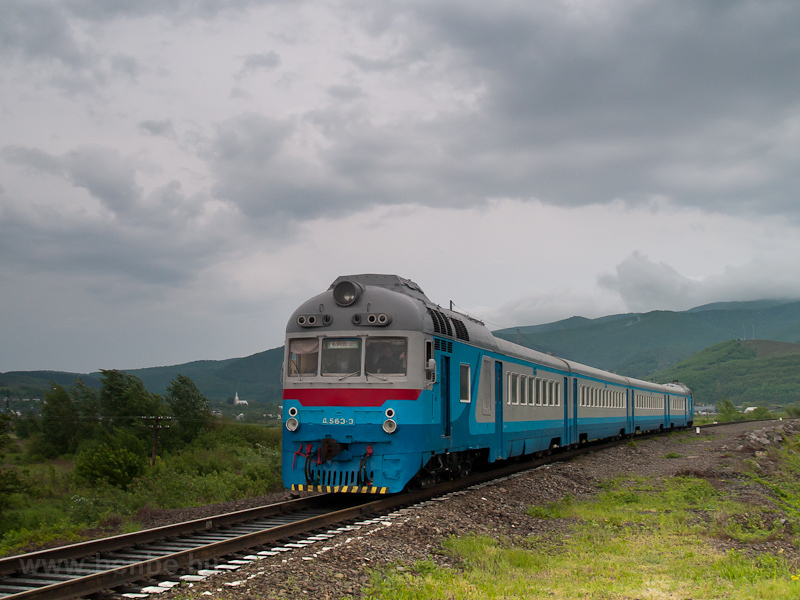 The line where this photo has been taken is a lot different: the Southern side of it can be reached by train from Chop through Berehovo, Vinohradovo-Zakkarpatia and Khust, but only through a stretch of it lying in Romania between Sighetu Marmatiei and Valea Visului. 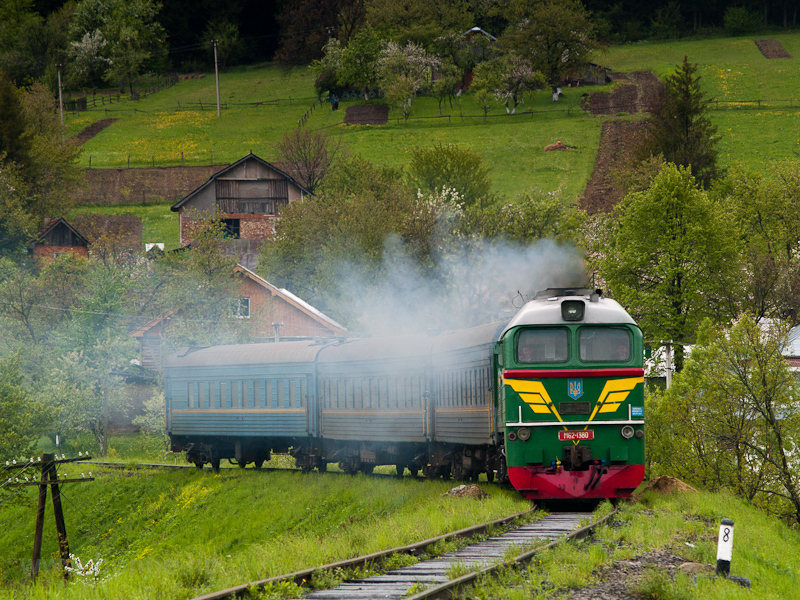 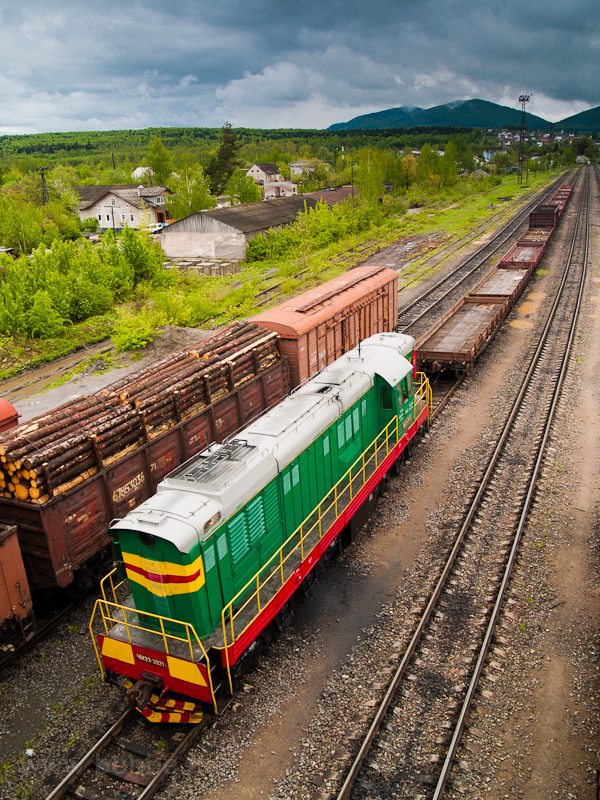 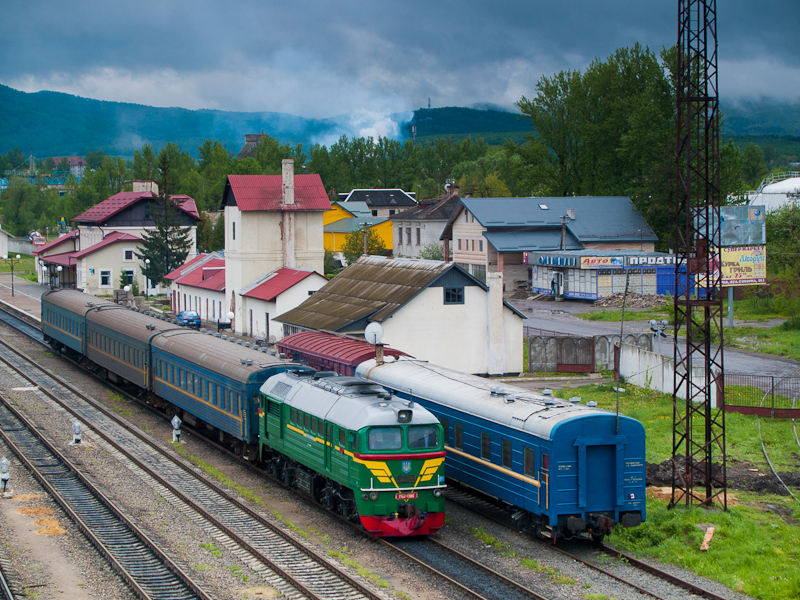 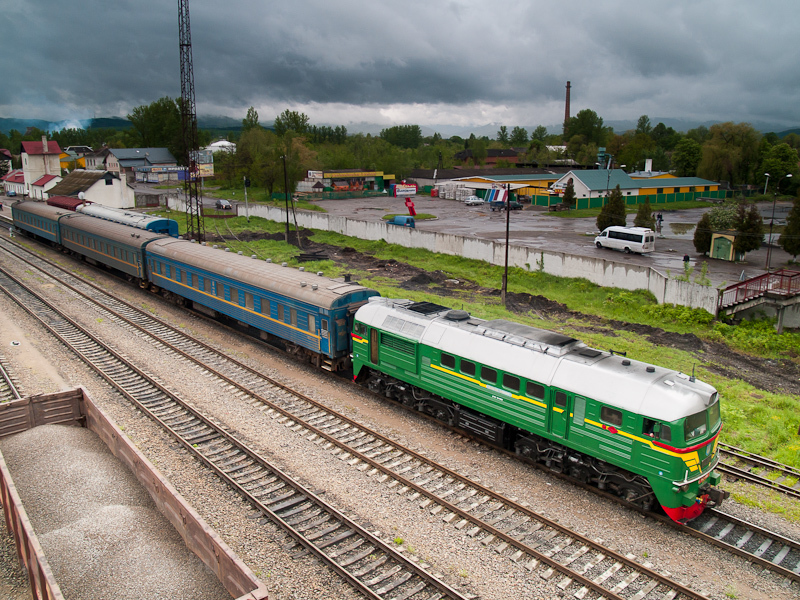 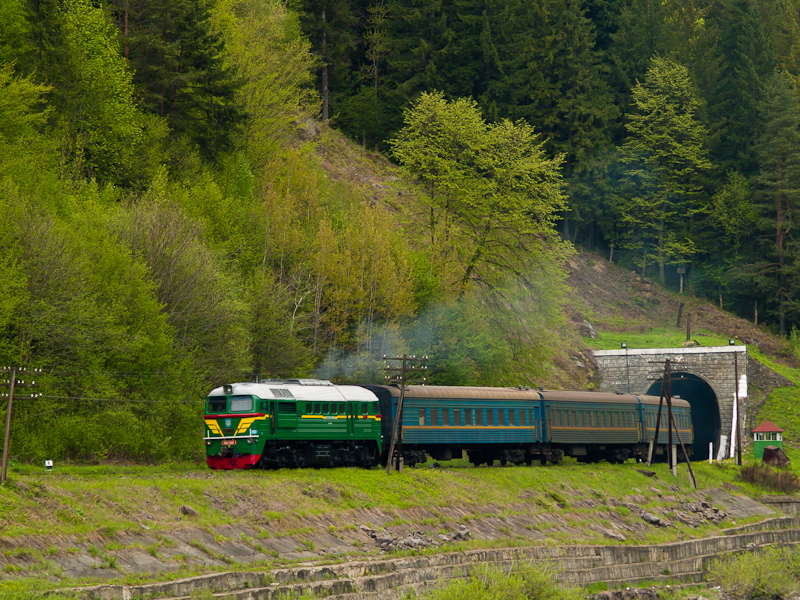 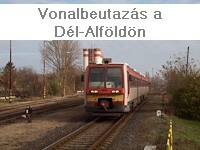 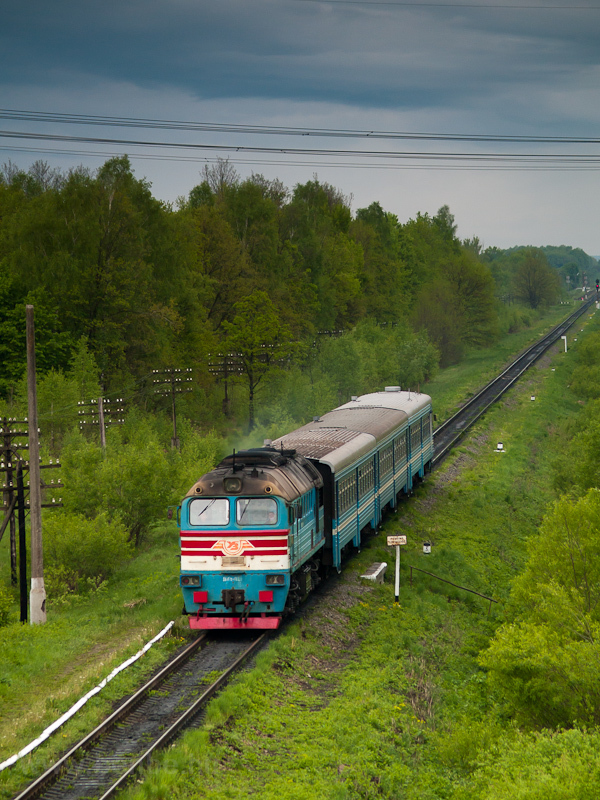 There is no broad-gauge traffic on the Romanian section, UŽ D1 trains go from Chop to Solotvino, a short branch line leading to the salt minig town just opposite of Sighet on the Ukrainian side of the Tisa river, and from Rakhiv over the Tatar-pass to Kolomiya and Ivano-Frankivsk; CFR runs trains from Sighet to Dej over a line built by Romania after the Trianon peace partly using an old MÁV line leading from Valea Visului over Viseu de Jos to Borsa. 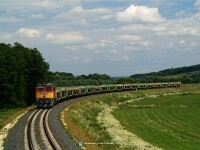 This line is mostly served by beautiful Sulzer diesel locomotives both on passenger and freight duty. 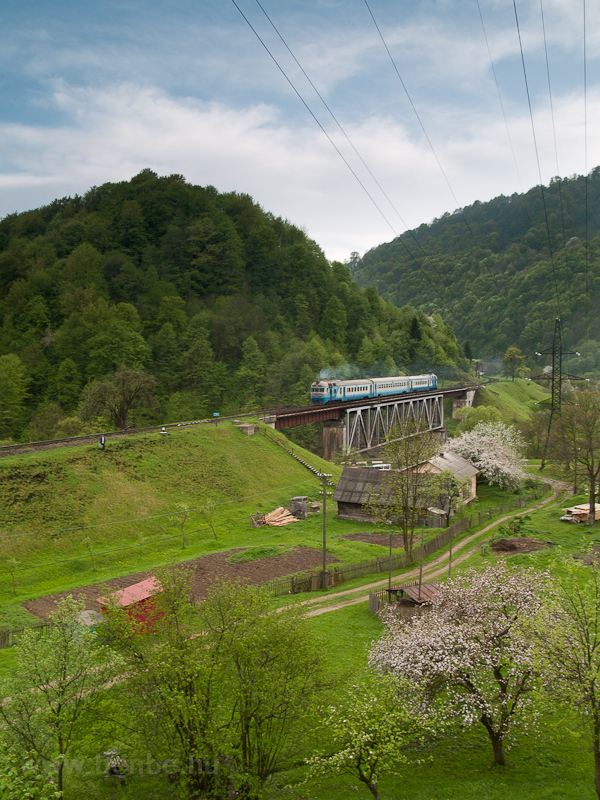 After Yasinya the railways leaves the Black Tisa valley and switches to the Lazeschina river, where after a horseshoe over this viaduct climbs among the hills towards the pass and reaches its summit in a short tunnel a little above 800 metres above sea level. 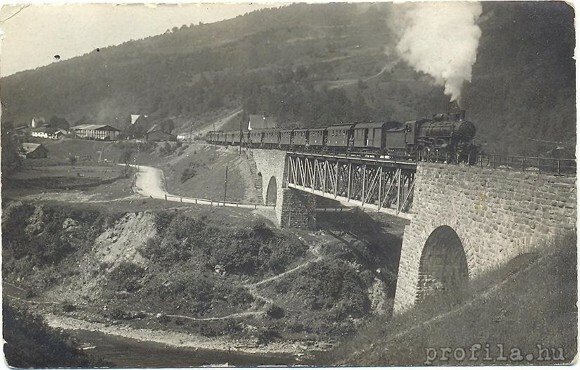 Perhaps the most exquisite construction of the line is the viadukt at Kvasi, where the railway crosses the valley high above the water, not just as an ordinary bridge. 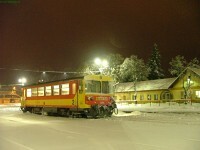 ...it only had one cab! 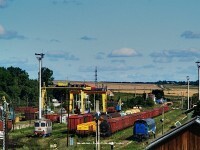 It had to be rotated at the terminus, but shunting with it is no bigger deal than with a standard M62 locomotive. 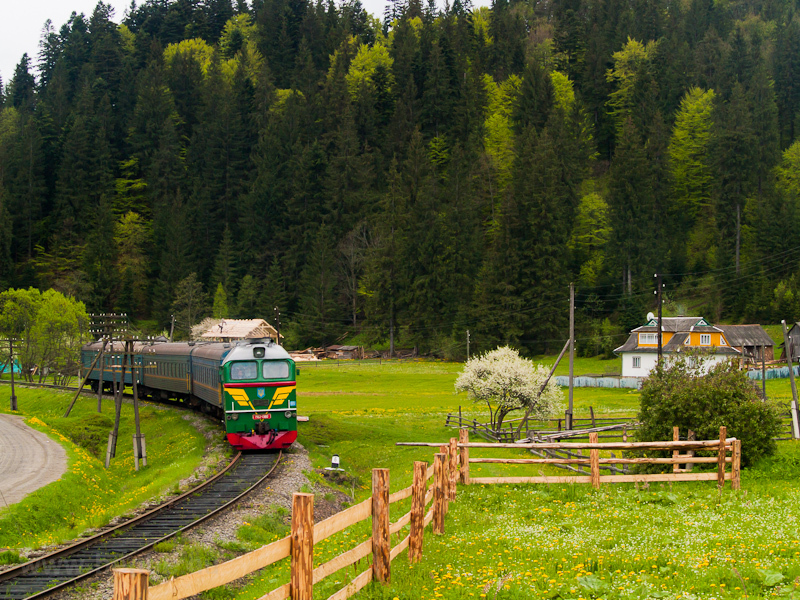 This beautiful Austrian State Railways station building is a close relative of the one standing at Braz station on the Arlbergbahn . 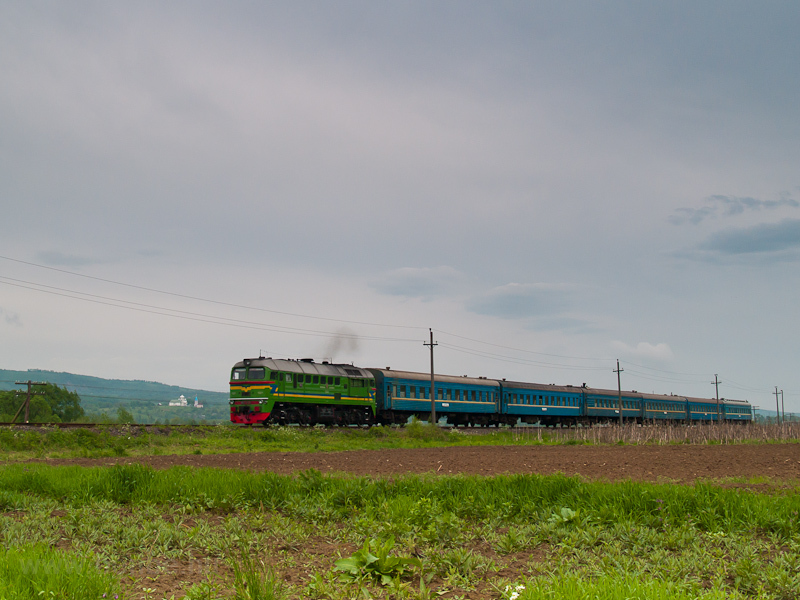 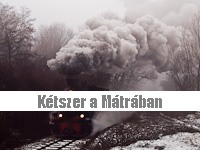 We met a locomotive-hauled consist replacing a missing D1 multiple unit in the Prut river valley - not a bad change I believe! 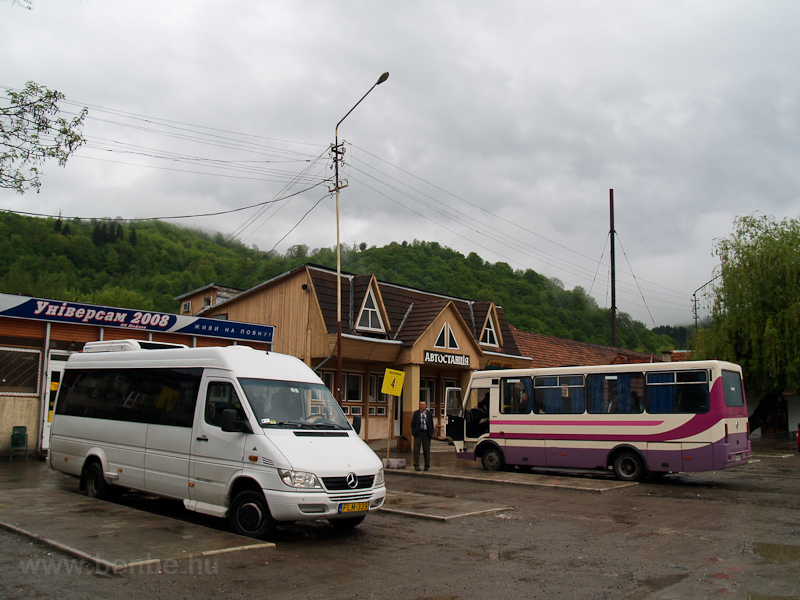 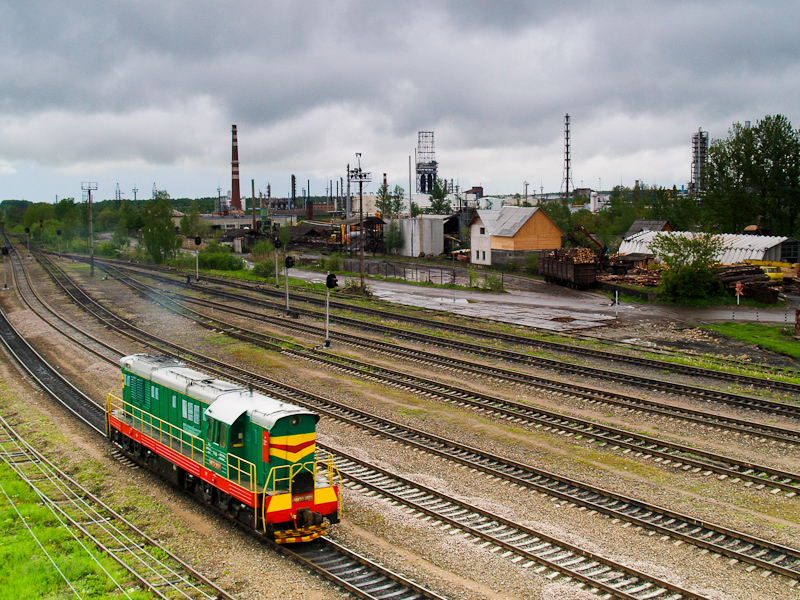 You will not be able to find this stop on Google Maps, but if you find Markivtsi near Ivano Frankivsk and look out for the gas tanks and their siding (which is visible in the background of this photo) you can locate where this picture was taken.